Narly Oak Boarding Cattery has been a family run business since it opened in April 1990. We have a full and thorough vet inspection every year in compliance with our licence from Bedford Borough Council. While the welfare of your pet is our main priority and we strive to ensure that the boarding experience is as stress free as possible for your feline friends, we also want to ensure that you, the owner, enjoy the experience as well. Our long opening hours enable you to drop your cat off at your convenience. We do not restrict you to certain drop off and collection times, come along anytime during business hours. We encourage owners to take their cats into their cabins in order to settle them in. You may bring bedding or toys with your cat to help them settle in. We only ask that you leave the double bed at home as we cannot quite accommodate it! With the knowledge that your cat is settled in and has a few smells from home you can then leave for your holiday with peace of mind. We can provide a local collection and delivery service for a nominal fee if you are unable to travel to us, simply ask us for more details at the time of booking. We provide well-known brands of food, both wet (tinned or sachets) and dry. If your cat has special dietary requirements or a prescription diet, you may be required to provide it. The continuity of providing the same food during their stay as you provide in the comfort of their own home eases the transition into unfamiliar surroundings and helps to avoid any upset tummies! Administering pills and potions is not a problem, we only ask that you provide us with an adequate supply of medication and full instructions on times and quantities. We take our time to get to know each cat individually giving plenty of cuddles on the way. Our spacious cabins are thermally insulated and individually heated, at no extra charge, to ensure a comfy and cosy environment during their stay. If you have more than one cat they can share. Only cats from the same household can share a cabin, as long as they are good flatmates. 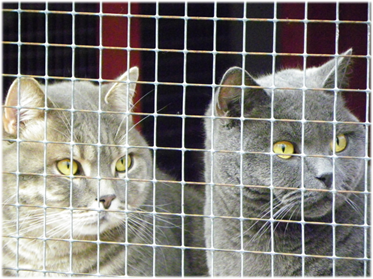 We reserve the right to move and separate cats, especially if they fall out with each other or their neighbours. Each cabin has an individual outside run which allows your cat to enjoy the scenery and bask in the British sunshine. Your cat has access to their run during the day, and is then secured in the cabin over night to keep them safe and warm. We aim to provide a hygienically clean environment, which is as comfortable as possible whilst also remaining both safe and secure. Our procedures are routinely assessed and modified if required and have kept us infection free since our opening more than 20 years ago. Please be sure to book an appointment to view the accommodation before making your reservation.